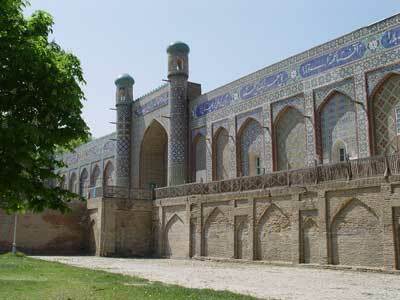 One of the main attractions of Kokand is its citadel – Urda, more known as Khudoyar-khan's palace. According to historical chronicles, 29 khans reigned in Kokand within 150 years, but the most famous among them was the last khan, Khudoyar-khan. He succeeded to the throne in 1845, when he was a 12-year-old boy, and became the brother-in-law of powerful military leader Mingboshi Musulmonkul. During his 30-year reign Khudoyar-khan lost his throne four times, and each time he reinstated his sovereignty. 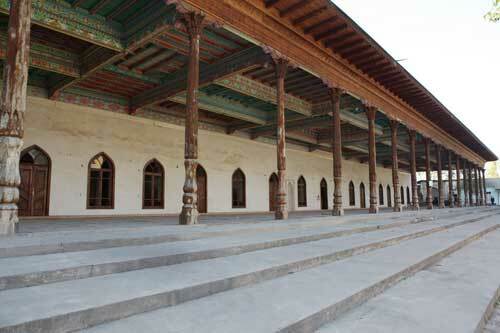 One of the main attractions of Kokand is its citadel – Urda, more known as Khudoyar-khan's palace. According to historical chronicles, 29 khans reigned in Kokand within 150 years, but the most famous among them was the last khan, Khudoyar-khan. He succeeded to the throne in 1845, when he was a 12-year-old boy, and became the brother-in-law of powerful military leader Mingboshi Musulmonkul. 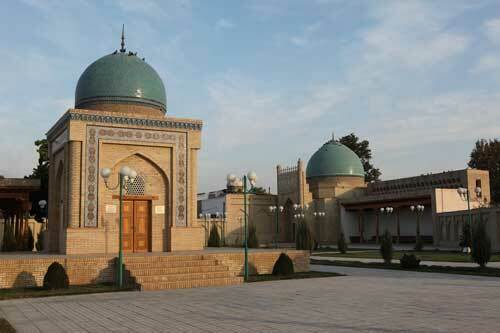 In the 18th-19th centuries, when Kokand became the metropolis of a strong and powerful state, many big, attractive mosques were constructed in the city. From written sources it is known that in the capital of the Kokand khanate there were 230 neighbourhood and 18 Friday mosques. 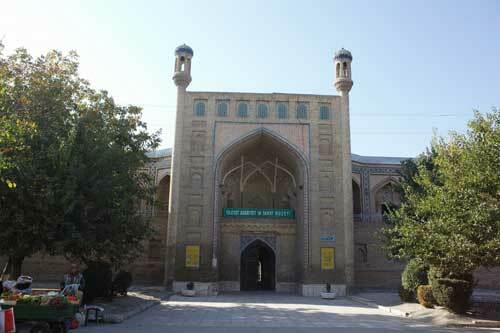 In Kokand in the 19th century, according to eyewitness accounts, there were 40 madrassahs – Islamic high schools. Unfortunately, just few of them survived to the present day. Among them is the city's largest Narbuta-bey madrassah. Chorsu Square in mid-18th century and the construction was completed in 1799. 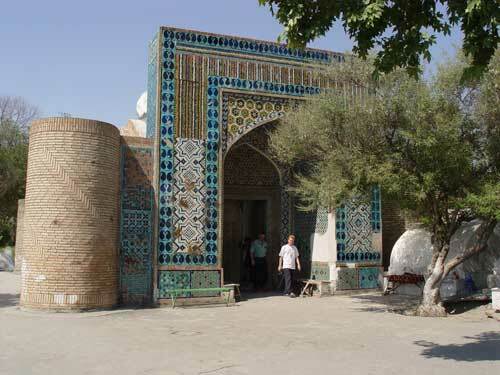 The history of Modari-khan mausoleum is connected with the Nadira- the famous Uzbek poetess. The wife and the mother of Kokand khans, she continued to play a notable role in the life of the court even after the death of her husband. 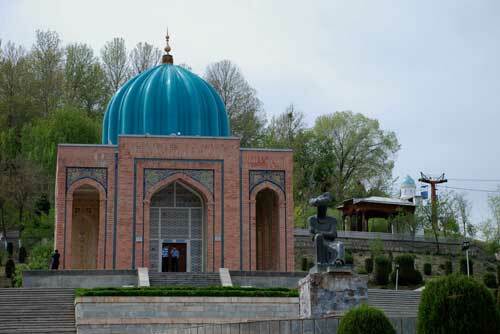 Her verses became the most valuable possession of the Uzbek poetry, whereas the buildings constructed by her orders have become the main attractions of Kokand. Islam has the tradition of replacing old timeworn cult structures with new ones of the same purpose. To construct a civil building on the site of a cult one was considered blameworthy and sacrilegious. 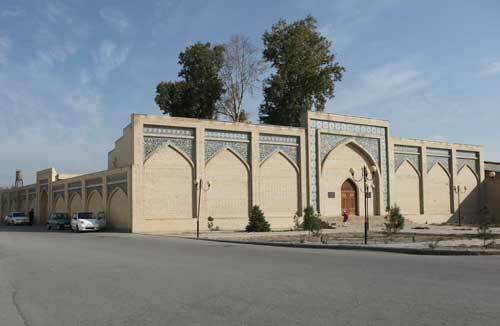 Thus, by tradition, in the early 20th century the new mosque Chakar replaced the old dilapidated Marghilan's mosque. One of the most peculiar ancient structures in Marghilan is Seieed Ahamad Hajji Madrassah. 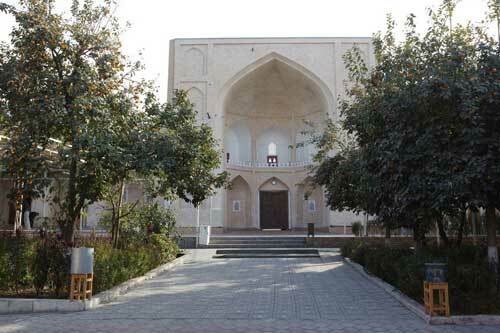 Its design is quite traditional for the Ferghana Valley architecture: a blind facade with an entrance leading into a square yard enclosed by rows of hudjra cells. A number of lancet archways partitioned by pillars, which form a certain architectural rhythm, lead to the northwest corner of the yard where a dissymmetric brick mosque with an ayvan terrace stands. From historical chronicles it is known that as far back as the beginning of the 1st millennium C. E. in Fergana Valley there was manufactured precious silk from the floss brought from China. In the 7th-8th centuries Ferghana masters began to breed the silkworm. 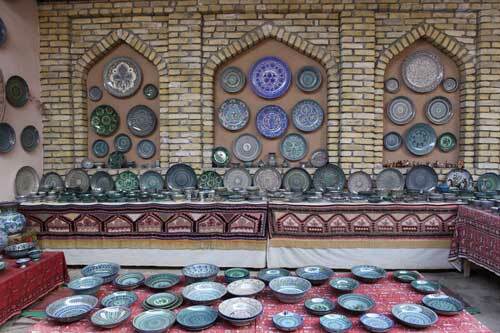 To this very day the main Uzbek silk-weaving centers are in Ferghana Valley, with Marghilan being its 'silk capital'. 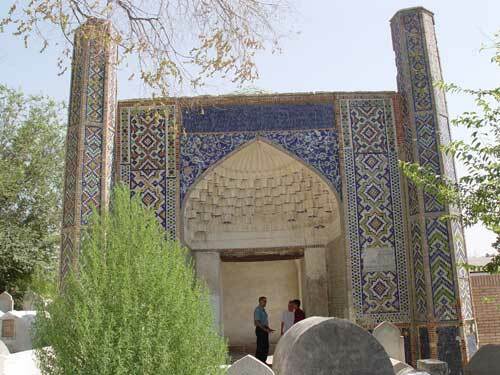 In Marghilan, whose age exceeds 2000 years, there are almost no medieval monuments – as in the whole Ferghana Valley – because of frequent earthquakes that take place in the region. One of the oldest and most unusual cult structures in this ancient town is Pir-Siddik Architectural Complex, which developed here in the mid-18th century. In Rishtan everything breathes history. History is everywhere. It is in the names of the streets and craftsmen's quarters: Mahalla Dukchion ('Spinners' Quarter'), Mahalla Kuloloni Bolo ('Upper Potters' Quarter'), Mahalla Kuzagaron ('Pot Makers' Quarter'), and Mahalla Chinnigaron ('Chinaware Masters' Quarter'). It can be found in Rishtan residents' homes where they still keep their grandfathers' tools and huge century-old hum containers for grain. 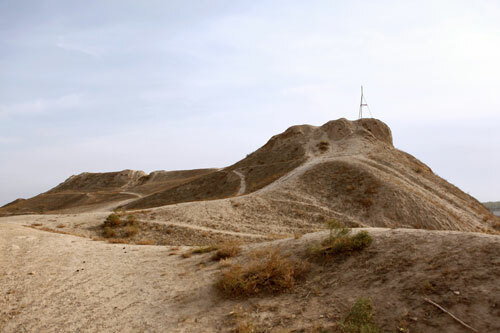 For several years the ancient settlement of Kuba on the northwest edge of Kuva District, Ferghana Province, was a site of active archeological excavations. In the early Middle Ages Kuba was a large trade and craft settlement where such crafts as pottery, metal-working and jewellery making were highly developed. The archeological finds prove that the settlement appeared in the 4th – 3rd century BCE. 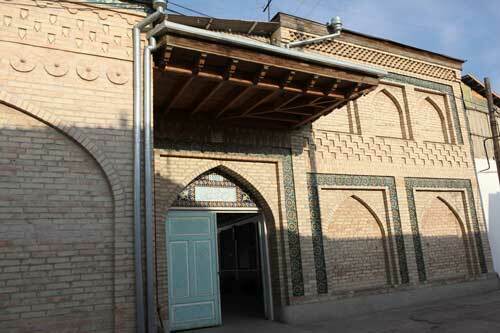 At the turn of the 19th-20th centuries in the western part of Jami complex there was constructed a Friday mosque. Contemporaries were impressed with its huge dimensions: the main facade alone had twenty-six arch openings. 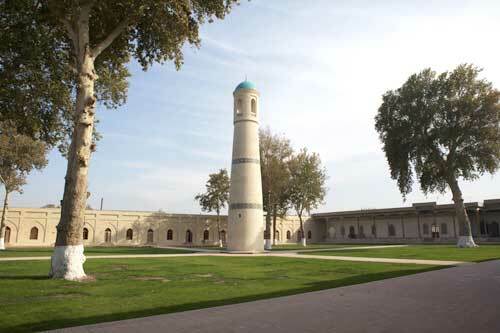 So far the Andijan Jami Mosque has been considered the largest mosque in the Fergana Valley. Zakhiriddin Mohammad Babur was an outstanding writer, poet, and scholar, a talented military leader and statesman. He was born in 1483 in Andijan. 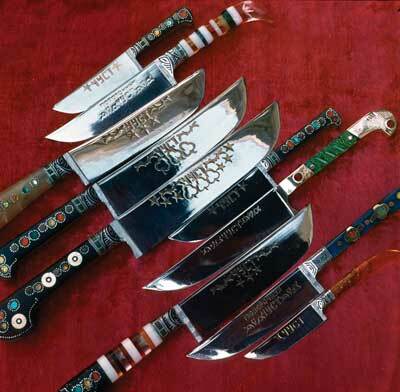 He was the son of Omar Sheikh, ruler of the Ferghana principality, and descendent of Amir Temur. His mother, Mikhr Nigar, was the princess from Mogolistan. Being involved in internecine strife of numerous rulers who aspired after the power in his ancestral territories – Mouverannahr – Babur lost his throne in Ferghana. 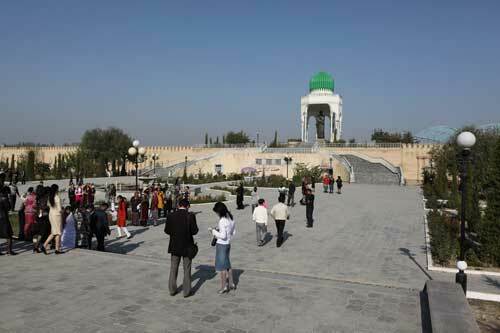 "In all Fergana no fort is as strong as Akhsi. Its suburbs extend some two miles further than the walled town". This is how Zakhiriddin Babur, Temur's descendant, conquerer of India and founder of the dynasty of Great Moghuls wrote about Aksikent in his book Baburnama.